The Aprilia panniers designed for the Futura are so good, and – thanks to the high level exhaust – so big that they have to be the number one accessory. They will even hold most full face helmets. They are also a joy to use – very simple to get on and off the bike, and the unobtrusive mountings mean the bike looks just as good with panniers or without. That’s why nobody bothers trying to fit aftermarket panniers to a Futura. The panniers themselves keep your stuff dry when new, but have been known to get a bit leaky on high mileage bikes. This is possibly due to the lids deforming after overfilling – so be careful not to try and cram too much in! They can also deform in a crash, though they do a good job of protecting the bike, should you be unlucky enough. While there may still be a few sets hanging around in dealer store rooms, they aren’t officially available new, so e-bay is probably your best bet here. Panniers from Caponords may look the same but they are not. 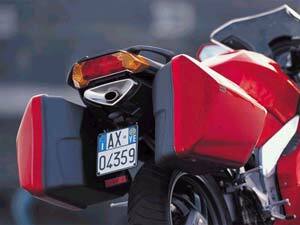 However, new Moto Guzzi Breva panniers will reportedly go straight on – see below. 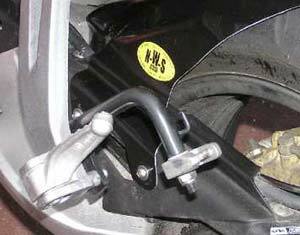 You’ll also need mountings – both the pair of brackets that attach to the rear footrest hangers and the plastic separator bar that attaches to the number plate mount. The separator bar is cheap enough new (the rubber tabs can be replaced with o rings when worn) but the brackets are expensive. Make sure the vendor supplies you with the brackets if they aren’t already on your bike. At least one part of the Futura lives on – its panniers. The Moto Guzzi Breva uses the same panniers as the Futura, though the mountings differ so you still need the Futura brackets and separator bar. 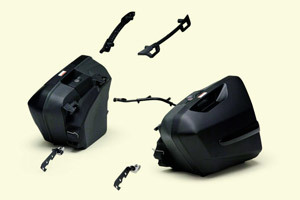 Guzzi Breva panniers also have better scuff protection. I’ve yet to see anyone use them but Apriliaforum member Rabandkab was able to try his panniers on a friend’s Breva in the US – and they went straight on.